As an effort to foster the next generation of humanitarian medical experts, AMDA recently launched the “Triple-A Partnership Program (TAPP)” which comprises of AMDA, AMSA (Asian Medical Students’ Association) and AMSA Alumni to conduct a range of collaborative projects. From 14 May to 09 June 2018, nine students from the National University of Singapore (NUS) underwent practical training at Tribhuvan University Teaching Hospital (TUTH) in Nepal. Ms. Babita Kumari, a staff member of AMDA Peace Clinic in Bodhgaya, India, recently traveled to Nepal to undergo maternal and child healthcare training at AMDA Damak Hospital, one of the three hospitals run by AMDA Nepal. We interviewed the hospital director Dr. Nabin to learn how the program went and how it all happened. As a part of AMDA`s activities to support disabled victims in Nepal, we have been visiting many of those with disabilities individually. Not just in the suburbs of Kathmandu, but also in remote locations undertaking home visits in the form of a mobile camp, joined by disability groups. As a part of the IDOBATA GAFU Program, while giving counselling to disabled individuals, we have also talked with neighbors about understanding disabilities. Throughout this training program in Japan, Nepal TV crew saw, learnt and inspired by efforts of different people related to disaster management especially from a Mass media point of view. The crew will report their learning in Japan to Image Channel, and would like to organize a lecture for the staff to improve their awareness on disaster prevention. They also promised to work on raising awareness of disaster prevention among general population in Nepal through their TV programs. 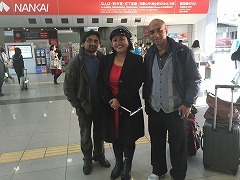 Despite of the tight schedule, Nepal TV-crew had many precious experiences in Japan when they visited Osaka, Iwate and Okayama prefectures. A deadly earthquake with a magnitude of 7.8 that happened in Nepal at 11:55 AM on the 25th April ‘2015 killed more than 8,500 people and injured more than 22,000 people. It was the worst natural disaster to strike Nepal since 1934.Hundreds of thousands of the people became homeless with entire villages flattened across many districts of the country. It destroyed also many world heritage sites and tourist spots. We have received a report on the field visit to AMDA -TUTH outreach clinic in Chautara from a Japanese doctor. One of AMDA headquarter staff, a Nepalese national, who participated during April 2015 Nepal Earthquake emergency relief mission, visited her home country again from 15th to 22nd August, 2015. She helped to distribute denim tarpaulins donated by a Japanese company to the affected people through AMDA Nepal. Following is her report on current situation in Nepal after the earthquake. Four months after the earthquake, monsoon rain triggered landslides that blocked roads and damaged many villages that had been already affected by earthquake. After three months passed since the earthquake hit and devastated Nepal, AMDA continues to support rehabilitation in collaboration with AMDA Nepal and local organizations. One of AMDA’s rehabilitation activities is for people with disabilities to return their home. Instead of providing them wheelchairs directly, AMDA decided to dispatch AMDA Physical therapist to the wheelchair manufacturing training session for technicians and provided materials to build wheelchair. In this way, local technicians can build and repair wheelchairs on their own in the future. injured 22,000 others. In collaboration with local organizations in Nepal, AMDA continues our reconstruction activities for Nepal Earthquake. One of AMDA reconstruction activities is related to physical rehabilitation services led by AMDA physical therapist (PT) who have participated in AMDA’s emergency relief activities for Nepal Earthquake. AMDA implemented GPSP/AMDA Multinational Medical Mission for Nepal earthquake. We dispatched medical doctors and other medical personnels from Bangladesh, Cambodia, Canada, India, Japan and the Philippines. Here are the activity reports from young Filipino doctors from Development Academy of the Philippines(DAP). Volunteer doctors, nurses and midwives from Japan, Philippines, Canada together with AMDA International paid visit at AMDA Nepal headquarters prior to deployment to affected areas. A meeting was conducted too as to what is the current status of the operations. We were accommodated very warmly and they assured us of our safety. The great earthquake struck Nepal on the 25th of April 2015, inflicting extensive damages across many municipalities including capital Kathmandu. AMDA jointly with Tribhuvan University Teaching Hospital (TUTH) have been delivering health services to the affected people in remote areas through “outreach clinic” service. On 25th of the April, massive earthquake devastated Nepal and left deep psychological scars in the minds of affected people. Following the initial emergency relief activities, AMDA has been supporting a training program for volunteer counselors in cooperation with Nepal Medical Association (NMA) and Japan Medical Association (JMA). AMDA believes this program can help to improve psychosocial care. AMDA conducted A MDA/GPSP Multinational Medical Missions(AMDA/GPSP MMM) for the great earthquake impacted Nepal on the 25th of April. We would like to share a report from a Cambodian doctor who participated in the mission. On the 14th of May AMDA team of 9 members decided to go to two different sites with AMDA Nepal members. One team of 2 AMDA Philippine members and 3 AMDA Japan members went towards Nuwarkot are and it was decided that other team of 2 Canadian members and 2 AMDA Japan members would be send to Sindhupalchok are for another mission. However on the day of departure there was a second earthquake that brought more damaged to Nepal. Due to the trauma suffered by the local staff and the security of staff due to the unsafe mountain roads the team returned back to Kathmandu on the same day. Despite of the large scale aftershock on May 12th, AMDA-GPSP (Global Partnership for Sustainable Peace) Multinational Medical team has been continuously conducting medical missions for the affected people. Because of the fear for more aftershocks, many in-patients stayed outside open area of the Tribhuvan University Teaching Hospital, where many of AMDA Nepal doctors are affiliated with. On May 12th, right after the aftershock, more than 100 patients were treated at the hospital. Patients were carried outside with their beds by their relatives and chose to stay outside overnight in fear of more aftershock. In addition to the patients with external injuries, increased number of patients who are seeking psychological treatment for their stress and panic syndrome are coming to the hospital. This aftershock, which happened two weeks after the major earthquake, hit Nepal when people started to get back to their regular routine and affected the people tremendously. On May 12th, the big-scale aftershock of Magnitude 7.3 and 6.3 hit Nepal one after another. Its epicenter is Sindhupalchowk, one of AMDA’s activity site. According to the local information, this aftershock also caused some casualties. All AMDA team members in Kathmandu, Sindhupalchowk, Nuwakot, and Gorkha are confirmed to be safe. On May 10th, the fifth Medical Team from Japan has departed for Kathmandu with medical equipment (30 sphygmomanometers, 30 stethoscopes and 5 pulse oximeters) donated by Tokushima prefecture that AMDA has concluded MOU with, for the predicted Nakai Trough Earthquake in the future. AMDA Multinational Medical Teams have been involved in relief activities led by AMDA Nepal. AMDA Bangladesh also dispatched their medical doctor to Nepal to participate in the mission. AMDA Multinational Medical Teams have been working in Khadichaur of Sindhupalchowk District since end of April. On May 6th, a medical team of one doctor and three nurses from AMDA Damak hospital, replacing a previous AMDA Damak team, arrived in the activity site and joined in the medical mission along with one medical doctor from Japan. The team was able to see 22 patients, many of them suffering from problems such as external injuries, general physical problems etc. Some patients delayed to seek medical care for their injuries or physical problems because they thought they would heal on its own. On May 6th, the fourth dispatched AMDA team from Japan has arrived in Nepal and moved to Sindhupalchowk on the next morning in order to participated in the on-going AMDA mobile clinic. AMDA Hospital Damak has been providing emergency medical facility to earthquake victims in Nepal since 26th April 2015 though our extended clinic in our hospital premises. As Damak was the least effected area by the earthquake, we had about 6 patients victim of earthquake. As the norm of AMDA family, we formed 11 members emergency relief (ER) team for the first phase of relief activities in collaboration with Damak municipality. On 29th April, 11 members of ER team from AMDA hospital left for Sindhu Sadabahar Hospital at Khadichour, Sindhupalchowk in two vehicles. One of the vehicle was from AMDA hospital and other one was a private vehicle belongs to an AMDA doctor. Unfortunately, due to damage to the highway, the team was force to halt that night in one of the community hospitals. On 3rd May, the joint medical team, consisting of staff dispatched by AMDA Headquarters in Japan and members of AMDA Nepal, moved from Sindhupalchok District, where they had been providing medical support, to the center of Dharmasthali in Kathmandu District. In Dharmasthali, even large brick buildings had collapsed and the air was filled with dust. Inspecting the status of damage in the city, the team visited victims’ houses and performed medical examinations where necessary. Even though the city is in Kathmandu District, no rescue team had yet arrived in over a week since the earthquake. Nepal lies in a major earthquake beltt wher the India and Eurasia plates meet. The constant crashing of the two plates formed the Himalayan ranges and the region's last earthquake with high magnitude was in 1934. The Earthquake occured at 11:56 A.M with its epicenter in Gorkha of Richter scale 7.6 - 7.9 on Saturday, April 25, 2015. Approximately, 110 aftershocks of more than 4 Richter scale were recorded between 11:56am on 25th April and 1:29am on 30th April. (Source:National Earthquake Center, Kathmandu. The Rescue Committee of Gorkha District, Gandaki Zone, where damage from the earthquake was so severe that no emergency relief aid had yet reached it, sent an Emergency aid request to AMDA’s Siddhartha Mother & Child Hospital (also known as AMDA Nepal Children’s Hospital), in Butwal, Rupandehi District. Upon receiving this request, AMDA Nepal’s members organized a medical support team which left Butwal on 27th for the neighboring Gorka District. The team comprised of 8 people: 3 medical doctors, 2 nurses and 3 non-medical staff. One week has passed since the magnitude 7.9 earthquake had hit Nepal. The huge shake had destroyed houses and roads to the remote villages in the mountains. Aid have not reached many of the villages. The first dispatch team from Japan conducted medical mission at Sindhu Sadabahar Hospital in Sindhupalchowk of Bagmati District. The team moved back to Kathmandu to receive the supplies that arrived from Japan. After the second dispatch from Japan and Bangladesh arrived in Kathmandu, they joined AMDA Nepal and arrived in Sindhupalchowk to replace the first dispatched team. AMDA Hospital in Damak, Jhapa District also arrived and joined the team in Sindhupalchowk. On 29th, the AMDA Medical team left Kathmandu to Mankha city in Sindhu Palchock district of Bagmati zone. No support has been reached this region and our team went with a car and it took them one day to reach there. It is only located about 80km away from Kathmandu. But because of earthquakes, rocks were lying on the road to the area and continues rain after earthquake made the road condition worse and difficult to travel. The 7.8 magnitude earthquake on 25th April 2015 has caused tremendous damage to the country. According to the UN Situation Report, as of 27th April, the death toll has risen to 3,351, and 6,833 are injured. As per the request from the Rescue Committee of Gorkha District in Gandaki Zone, on 27th of April 3 doctors and 2nurses were dispatched from AMDA’s Siddhartha Mother & Child Hospital in Butwal to Gorkha District, where the damage was hardest and no medical team has reached there as of the 27th. AMDA team includes a doctor who has once received training at a maternal clinic/hospital in Japan. They will travel by car part of the way, then walk for 3 to 6 hours in order to reach the activity site. On the 27th of April, AMDA team arrived in Sankhu City, suburb of Kathmandu. After their arrival, they set up a tent and started an emergency medical clinic with the help of doctors from AMDA Nepal. Approximately 60 patients were treated during the mission and major symptoms were high blood pressure and minor injuries. Fortunately, no patients were suffering from major injuries or broken bone etc due to the earthquake at this site. Having left Okayama on Sunday 26th, AMDA's first medical team left Kuala Lumpur on Monday 27th morning and arrived safely at Tribhuvan International Airport inNepal, at 12:45pm. According to our team, the flight was full of rescue teams and media crews from different countries. Due to the increase in the number of aid-flights and the limited capacity of the Airport facilities, the airplanes had to circle and wait for a long time above Tribhuvan Airport and many flights could not even land and had to head back. According to our team the airport building was a chock-a-block with people everywhere they turn.